This past weekend I attended the annual Weston Price conference in Atlanta. This year’s highlights included a staged debate between Dr. Mercola and Joel Salatin on the merits of GMO legislation (watching Dr. Mercola have a meltdown was totally awesome) and dozens of talks centered around holistic therapies for chronic diseases. And while I loved meeting so many people and attending so many great talks, this year’s conference held an unexpected surprise for me. So much so that I want to share it with you. I know. That doesn’t sound overly exciting. In fact, it probably sounds pretty lame. And if I’d not seen it myself, I’d have thought the same thing. 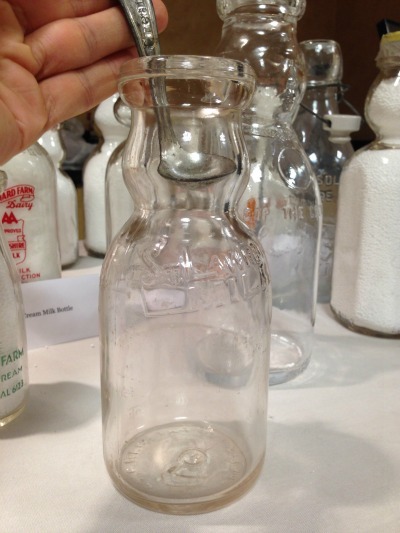 Tucked away in the back corner of the exhibit floor was a small room with hundreds of butter artifacts from the 17th through 20th century including magazine ads, old bottles, packaging and things like churns and cream separators. But what I found so fascinating was the bigger picture the exhibit had to tell. 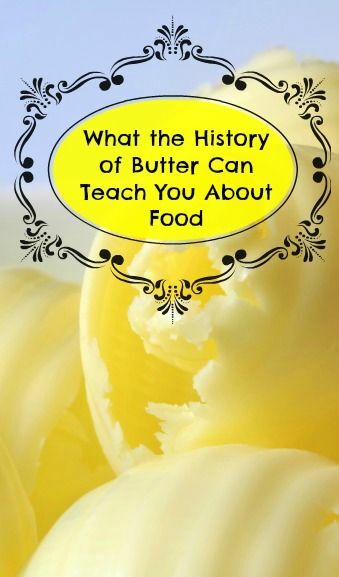 You see, it wasn’t really about the history of butter. It was really about the story of food and food production in the 20th century. So let me take you on a little visual tour of the exhibit so can see exactly what I’m talking about. 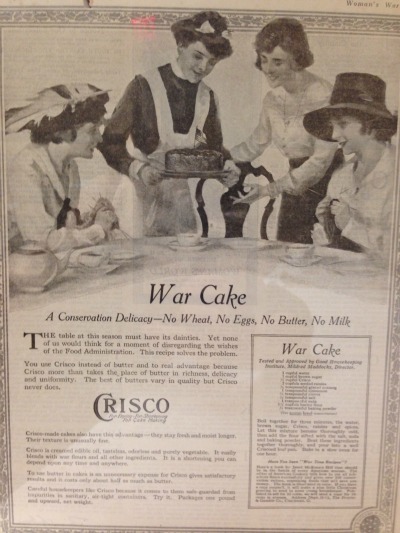 Let’s start with one of the many magazine ads that were on display from the first half of the 20th century. But the real point I want to make is the first sentence at the top of the ad. Five million! 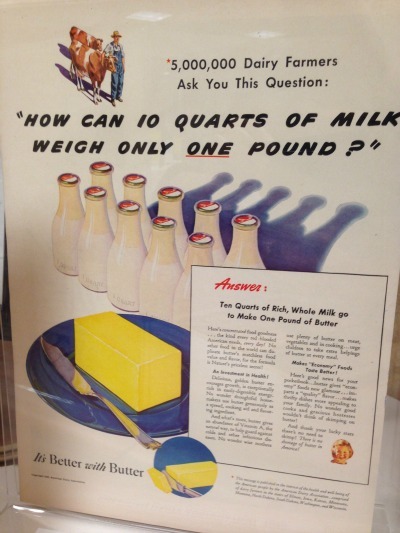 That’s how many dairy farmers existed in America pre-World War II. Guess how many dairy farmers we have left today? Less than fifty thousand. That’s a ninety-nine percent drop in less than a hundred years. And only a small fraction of those fifty thousand are producing real milk which is nutrient-rich raw milk from grass-fed cows. And that’s what makes this next ad even more fascinating. Do you notice anything unusual about this ad? Hint: it’s in red text. That’s because their cows are not grass-fed. 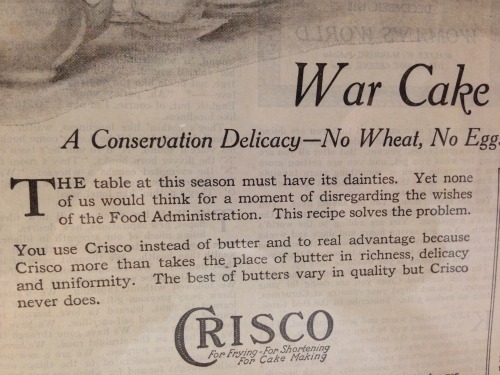 But to be fair, even a raw milk dairy (as if any of them could afford to advertise) could not run such an ad today. But that’s not because it wouldn’t be accurate. Rather, it’s because no one today would have a clue what it means! June is the month when grass grows most rapidly and is highest in nutrients. Cows that feed on grass during this time produce a rich, sweet flavor in their milk. This is why Dr. Weston Price, in his travels around the earth in the 1930s, found dairy-based cultures that held late spring as a sacred time of the year. Many had religious ceremonies that honored the life-giving force in butter from the cows that fed on the rapidly growing grass of June. 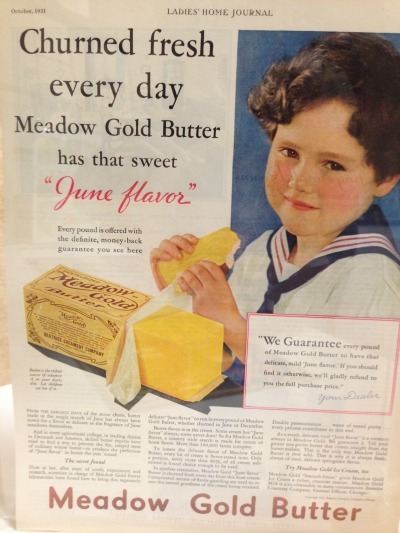 This ad shows that there was some competition in the butter coloring market! Perhaps this was one of their competitors? I wish I could tell you what they used for the orange butter color. Here’s a close up of one of those boxes. Do you notice anything interesting? 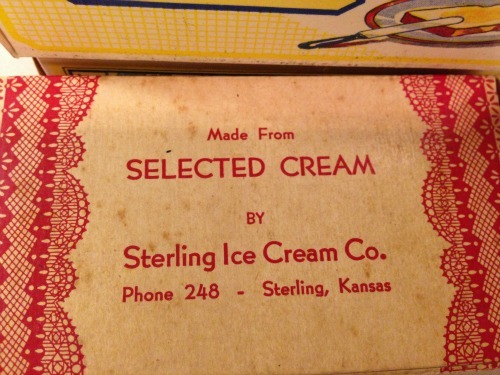 When was the last time you saw a 3 digit phone number? 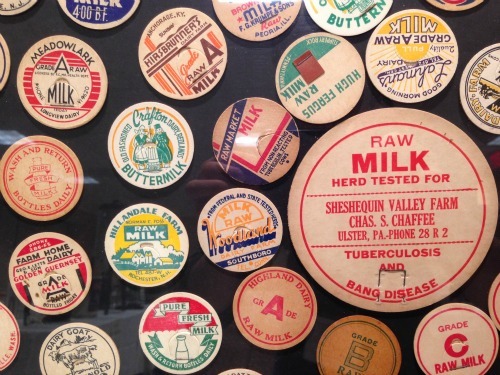 And how about this collection of old raw milk bottle caps? You definitely don’t see those anymore. 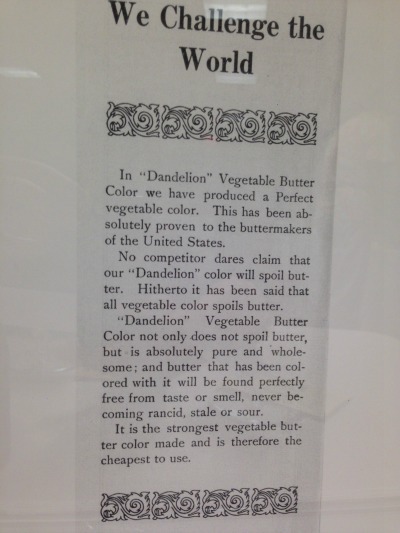 But beyond just butter was the other side of the history of butter. 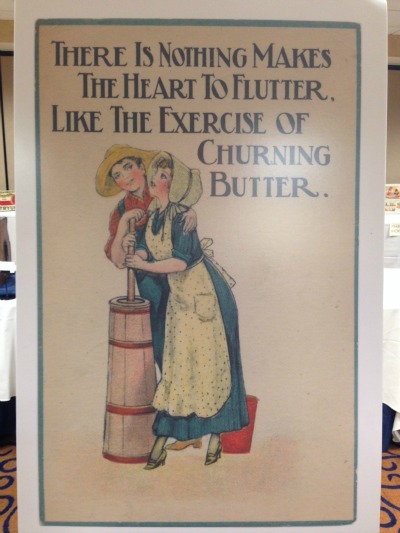 And that’s the story of margarine. 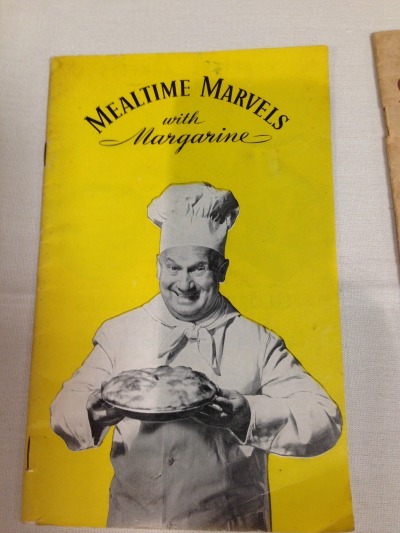 And the story of margarine is really the story of the rise of the food industry in the 20th century. Isn’t it insane how we all fell for this? 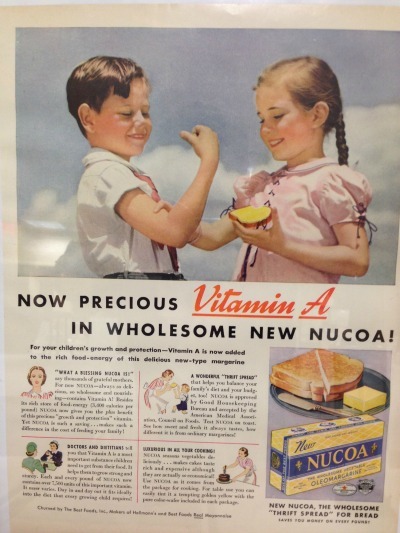 Looks like the vegetable oil industry saw a great opportunity during the food rations of WWII to compete with butter. So much so that they started printing recipe books! But thankfully, this demise is coming to an end. Butter sales are steadily on the rise again! 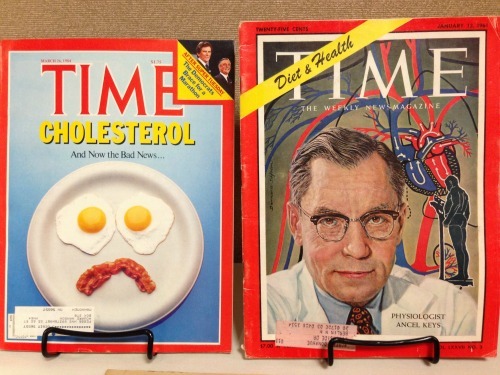 And did you hear about the recent announcement from the FDA that they’re banning trans fats? No joke. Does it make you want to do this? Admittedly, as much as it’s interesting to glimpse and romanticize a bygone era, I’ll stick to my store-bought grass-fed butter, thank-you very much. Joking aside, the exhibit was sort of a microcosm of what the Weston Price conference is all about. Stealing a line from Michael Pollan, I could sum it up in one sentence: Don’t eat food that your great grandmother wouldn’t recognize. In fact, I would add a few more “greats” before the word grandmother to really be on the safe side. But the coolest thing about the exhibit was that I got a personal tour from its creator! That’s Sandeep Agarwal (I hope you can figure out which one is Sandeep). 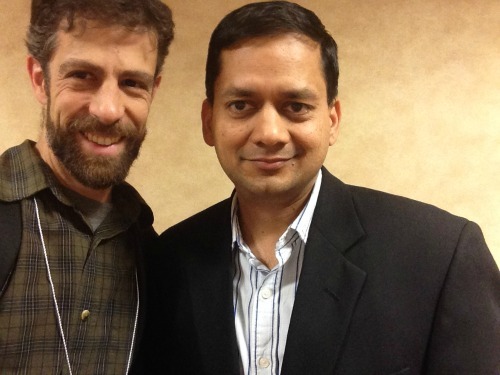 He’s the owner of Pure Indian Foods, a fifth generation company that makes organic ghee from grass-fed cows. I got a personal tour because I was the only one in the room at the time! Thus, the handheld camera shot. When Sandeep wasn’t manning the history of butter exhibit he was working alongside his family at the Pure Indian foods exhibit table. They were giving out free samples of their products all weekend long and let me tell you, this stuff is THE BOMB! 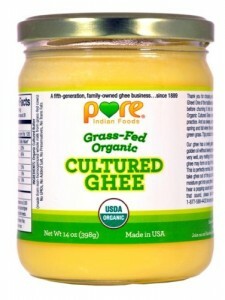 In case you don’t know, ghee is pure butterfat (a form of clarified butter) and it’s a staple of Indian cuisine. But it’s becoming more common in America because of the rising tide of dairy allergies and sensitivities. Casein (milk protein) and lactose (milk sugar) are the two most problematic parts of milk and milk products. 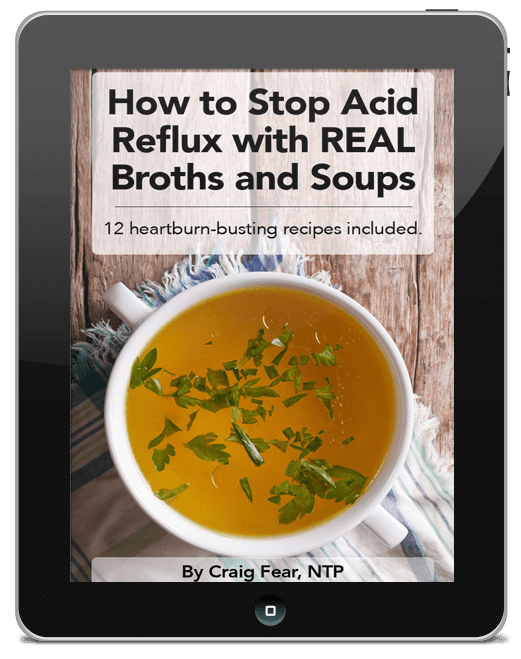 However, ghee is almost 100% free of both lactose and casein, even more so than butter. 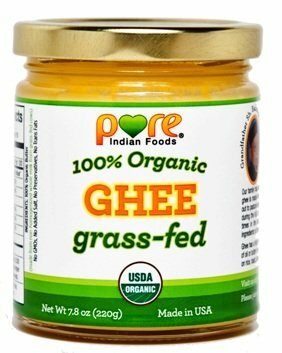 Best of all, ghee is unbelievably delicious! I call it caramel butter because that’s exactly what it tastes like to me. Seriously, it is pure heaven. The first is their 100% organic, grass-fed ghee. You can check it out on Amazon right here. This product has an average rating of 5 out of 5 stars from over 400 reviews. That’s virtually unheard of on Amazon! The second is 100% organic, grass-fed cultured ghee. And the third is coconut ghee, a 50-50 blend of 100% organic, grass-fed ghee and organic virgin coconut oil. 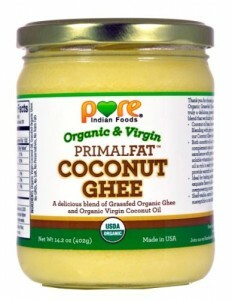 Click here to view coconut ghee on Amazon. 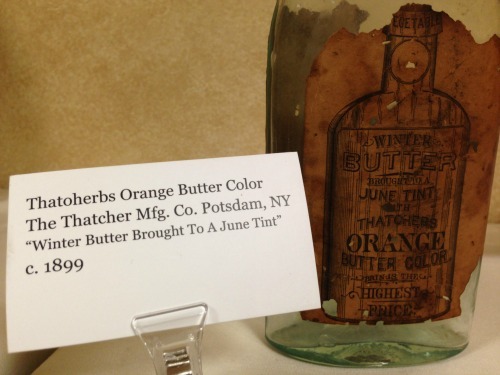 Finally, do you have an antique butter item lying around that you’d like to donate to the butter exhibit? 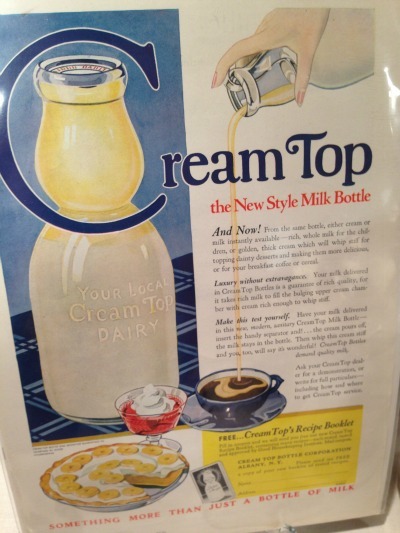 An old magazine with an ad? 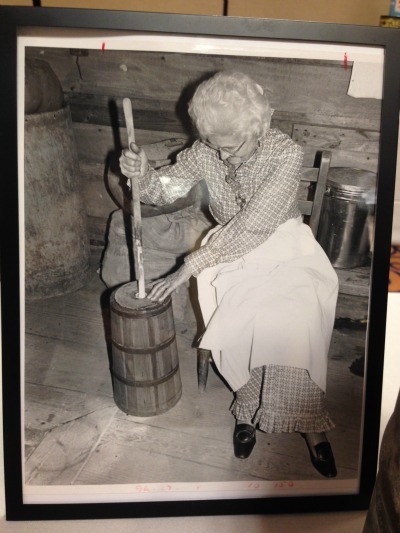 Maybe an old butter churn? How about an old butter-working tool? 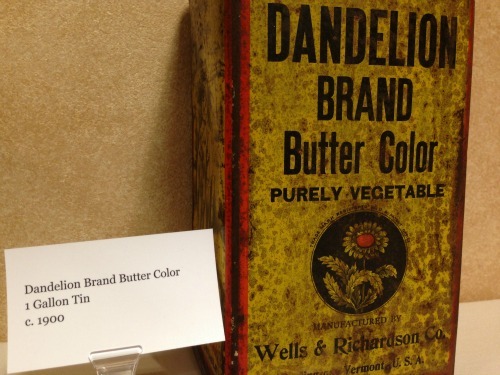 You can donate them to the butter exhibit! As you can see, Sandeep is quite passionate about the history of butter and he’d love to grow his collection! Check out Sandeep’s other site, www.butterworld.org which is dedicated to the butter exhibit and where you can see more images like the ones above. 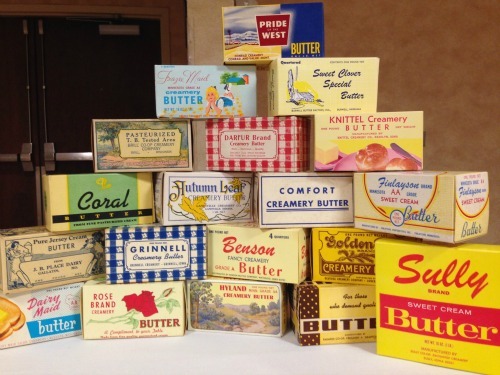 If you have a butter artifact you’d like to donate, you can reach out to Sandeep through the contact page on the site. Well I hope you enjoyed my little overview of the exhibit!